The MEA Automotive Polyurethane Market size is expected to increase at a highly commendable pace over the ensuing years, with a target valuation of $385mn by 2024. The recent launch of a new trade association for the automotive industry in the Middle East and North Africa is a fact that can vouch for the authenticity of this forecast. The platform, called the Automotive Association Middle East and North Africa (AMENA), has been launched to provide a place for exchanging ideas and reviewing pivotal issues in the region. The trade body will be presenting ideas in various areas related to the automotive industry across MEA and is aimed at augmenting the progress of the regional automotive domain. With Saudi’s decision to allow women behind the wheel, a considerable upsurge in automobile demand is anticipated – a factor that may augment MEA polyurethane market for automotive industry. According to estimates by AMENA, the lifting of the ban can result in 3 million new drivers, creating new opportunities for automotive manufacturers and importers. Saudi Arabia has set an ambitious plan, Vision 2030, to revamp its oil dependent economy and public finances. One of the aims of the plan is to minimize climate change, which certainly will remain unfulfilled with the increasing number of vehicles. 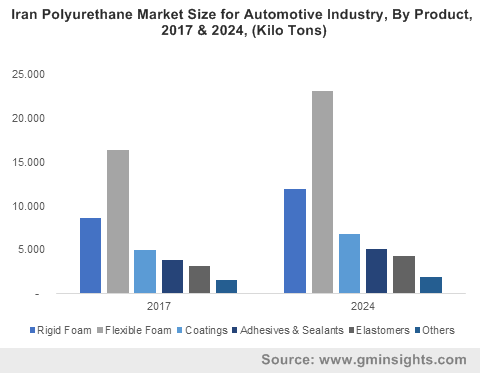 In this regard, it would be fair to state that MEA automotive polyurethane market will observe an appreciable growth ahead, as automakers will be looking forward to deploying PU liberally for lighter vehicles with more design freedom. Estimates predict that the automotive industry, especially the commercial vehicles market will register positive growth in Saudi Arabia. Favorable government initiatives, stabilization of crude oil process, and the expanding infrastructural development are expected to drive the sale of trucks, vans and buses in the Kingdom. The Saudi Arabia General Investment Authority (SAGIA) is also planning to accommodate a heavy volume of vehicles with the expansion of the country’s road infrastructure. As per statistics, the Kingdom’s Ministry of Economy and Planning is set to spend $27 billion for the development of roads that is expected to drive the sales of commercial as well as private vehicles. With PU being majorly used in the development of lightweight, fuel efficient vehicles, it is certain that Saudi Arabia will evolve as a lucrative investment destination for automotive polyurethane market in MEA. However, statistics also depict that Saudi Arabia is not the largest automotive manufacturer of the region. The three countries that produce the most automobiles in MEA are Turkey, Iran and Egypt, that collectively accounted for 2.8% of all vehicles produced in 2016. Turkey’s geographical location ensures that the country stands to prosper in terms of the automotive industry, as it lies at crossroads between Europe, Africa and the Middle East. The Turkey automotive association aimed at raising the vehicle production of the country from 1.49 million in 2016 to 1.65 million in 2017 with exports exceeding $27 billion in 2017. Iran holds the 11th rank globally when it comes to passenger vehicle production. The country’s automotive industry has incurred a profitable trajectory with focus on technological advancements and competetive development. Considering that the average growth of the Iran automotive industry remains constant, experts predict that the country will be producing more than 2 million passenger vehicles by 2025. The prevalence of joint ventures such as the PSA group’s commitment to invest $330 million in the Iran automotive market and Volkswagen’s decision to start selling in Iran will also impel the MEA automotive polyurethane market size. The use of PU in automobiles has been one of the most disruptive trends in the automotive industry as the material is not only known for its durability, corrosion resistance and coating capability but also for being very effective in the manufacturing of light weight vehicles. Light weight vehicles have come to be the buzzword in the global automotive industry, MEA being no exception, as automobiles have come to be considered one of the chief contributors in the rising CO2 levels of the earth. PU not only reduces the weight of the vehicle to make it more fuel efficient and less emission prone but also improves passenger safety. PU even provides superior passenger comfort with its application in seating. Consequently, its rising deployment will have a commendable impact on MEA automotive polyurethane market size. Indeed, as per estimates, automotive polyurethane market in MEA from seat foams is anticipated to register a CAGR of 5% over 2018-2024. As the usage of PU to reduce production cost and make vehicles more reliable surges in the ensuing years, MEA automotive polyurethane market is expected to depict a massive rise in sales and volume. With the Iran automotive industry recovering from sanctions crisis, Turkey beginning to gain foreign investments, and Saudi Arabia is taking ambitious strides in upgrading the country’s social, economical and infrastructural spheres, it is rather overt that the MEA automotive polyurethane market will traverse alongside a highly profitable graph over 2018-2024.